Yes THIS is their Day, the day they planned and waited for so long and schemed for Pilate, The Roman Prelate to do their killing for them. It is the Big News flying around Jerusalem today, the trial and death penalty has been issued for Jesus the Carpenter’s son who calls Himself the Son of God. 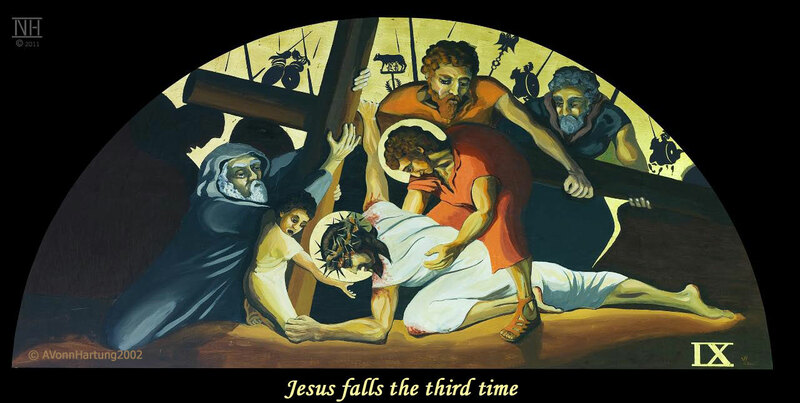 Jesus falls. The Cross is extremely heavy, so heavy he has to drag it. He is exhausted from lack of sleep; it has been over 30 hours since he last slept and He has endured repeated brutal beatings and torture. The day is hot and the way crowded with spectators many-most jeering and perhaps even tripping him up. In the midst of this scandalous spectacle rushes an old man full of compassion, not concerned for his own safety as also is the Saintly woman who rushes to help him as well and a man from the crowd, a stranger who steps forward to steady the Cross. Here we also see the gentle and good people along The Way – even the creatures of Creation draw near as in witness of our Lord’s Passion. What is this Centurion allowing to happen? What is allowing him to become less of a soldier and more human, just another man, just another son? It is the beginning of a life changing event in the life of the Centurion and the life of the world! It is the essence of all Conversion stories; the moment when the unbeliever through bewilderment begins to doubt his own assumption, begins to BELIEVE!!! Here we see the first results of this softening, this Conversion of the Centurion. 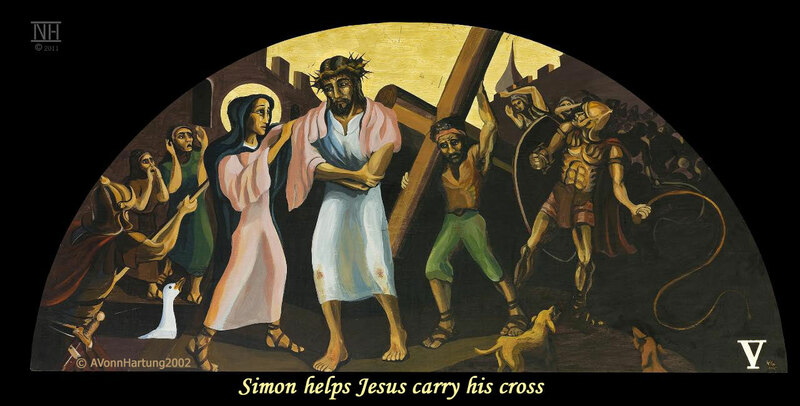 He allows Simon (he must have asked him his name and so perhaps it was so recorded) to carry the Cross. Now the saintly woman has returned with a blanket–the color pink, symbol of Maternal Love. All the fear is gone! This is a true sign of Great Faith – lack of fear! The soldier is not accustomed to this! Children, yes he can understand them not knowing the consequences of defying The Authority of Rome! But these Adults? These Women? What’s going on here? Even his men are acting out of character when this Nazarene breaks rank and embraces His mother, and a bystander, a WOMAN faints! His own man and soldier also breaks rank and takes her in his arms in compassion. There is something happening that is not easily understood and it is beginning to affect him and his men. Another woman steps forward from the crowd. It is Veronica, a friend of Mary’s and the family. She wipes the face of Jesus. She represents Perfect Faith, composed and without any trace of fear or anxiety. She calmly wipes the blood and sweat from our Lord’s face with her Veil on which appears the perfect Image of God. The short man sees this miracle and tells the man next to him who cannot see it. 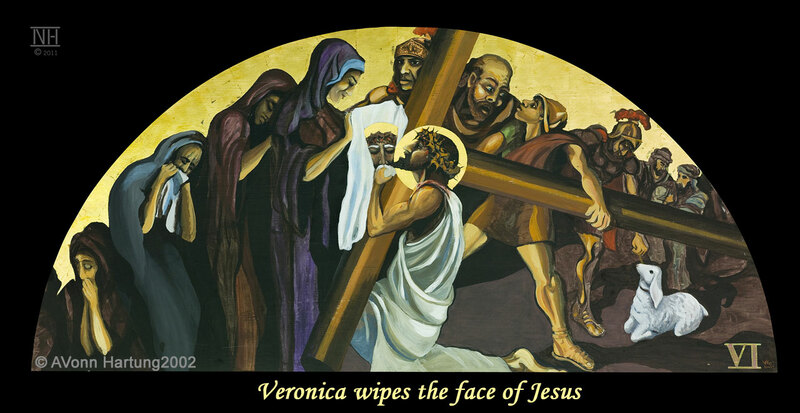 The Centurion is mesmerized by the Faith of Veronica which is symbolized by the stages of progressive belief that shadow her: from complete despair and unbelief furthest away, to doubt and a sense of powerlessness and finally to hesitant timidity next to Veronica’s faith-filled act of compassion and courage. This is the moment that, for the Centurion confusion and doubt is melting away. He is SEEING BELIEF and he is stunned by what he SEES! There is a Power he feels that is stronger than his own and what he represents, “Imperial Rome.” And it is coming through these powerless children, old men, women and this beaten, condemned criminal who is struggling to get to where it is that He will die! This composition is simple and sparse. It is meant to show one of the stages of acceptance of the inevitability of surrender and death. The feeling of isolation and hopelessness that comes when the physical body sends the message to the brain that resistance is fading to the point of no return and that death is winning out over the natural forces of life. Jesus is not giving up and is being helped, but the sparse number of helpers lend to this feeling of helplessness and isolation. Jesus is most probably entering another level of consciousness where he is relying more on the strength of His Father than on His own physical ability to carry on. 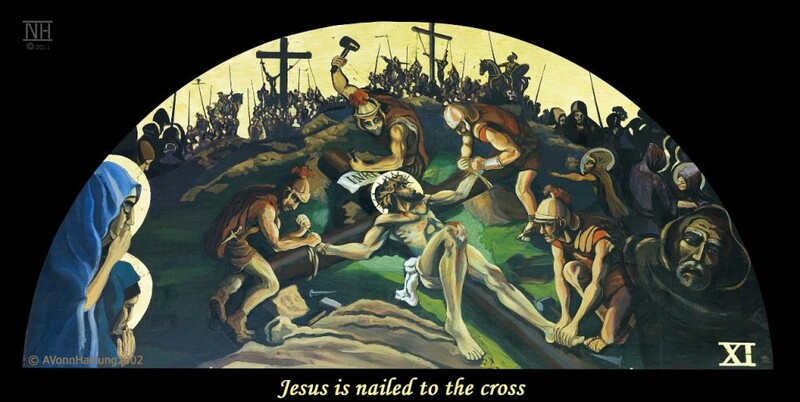 But His will is strong as is depicted by His right hand on His Cross. He appears not, in any meaningful way, to be supporting the Cross but struggling not to let go of it! He and The Cross have become one! He is doing the Will of His Father. He will complete what it is that He has been sent to accomplish. Coming upon the wailing women of Jerusalem He takes pity on them but instead of consoling them in the standard sentimental way, He speaks to them and to us as a prophet. “In this terrible moment Jesus is not thinking only of Himself, of His suffering, of His drama. He is concerned with the drama of humanity, of all human beings. He prophetically sees another human drama opening in front of his eyes. And these wailing women have to change their lives. He was again telling them, and through them those who were following him with a smile on their faces: “the kingdom of God will be taken away from you and given to a people who will produce its fruit” (Mt 21:43) because “the sound of wailing is heard from Zion: ‘How ruined we are! How great is our shame! We must leave our land because our houses are in ruins”(Jer 9:19)”. In this station I attempt to show the complete exhaustion of Jesus. He is literally being held up by the strong youth who straddles Him. 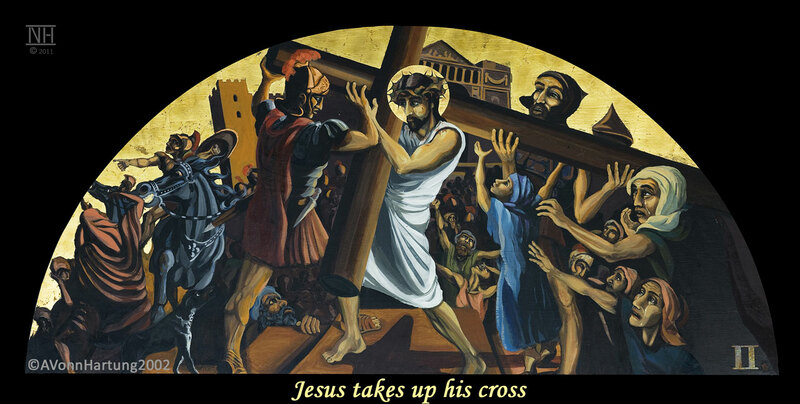 Symbolically He is at the strength-level of a small child, yet He still holds on to His Cross rather than supports it. The symbol of the old man is another indication of the lack of strength that Jesus feels yet both the child and the old man show determination and faith to go on that Jesus Himself feels although He is completely spent. The symbols in the background are the emblems of the powers of the world, those of the Roman Empire of His time, but beyond that they symbolize all Imperial predatory power and wealth gained through injustice and military might. The Cross is ever present and symbolizes the Sacrifice that must be made to redeem the Sins of the world. Once again, we see Jesus the center of attention. Of all the humiliations he has been given this in some ways is the greatest. He is stripped in a way that He is feeling naked, but in His nakedness and through whatever indignity He is feeling, God is showing the beauty and strength of the human body, and the physical beauty of His son. This I wanted to portray, as so many times Jesus is shown as effeminate. He was a powerful worker, a carpenter in the sense that He did many tasks with His father Joseph with heavy lumber that was required to build houses, means of transportation as well as plows and other farm equipment and tools. His musculature attests that He was a working man, a laborer serving the needs of His neighbors. He stands in great dignity as the king He is, not the condemned cowed criminal His tormentors would like Him to be. 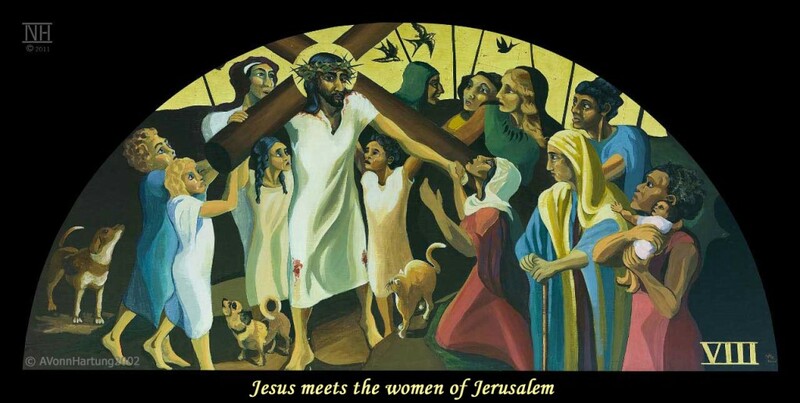 Here we witness the full spectacle at the scene of the Crucifixion, the Big Event of Jerusalem where so many have come for the celebration of Passover. What great entertainment for many, what terrible shock and sadness for our Lord’s followers. The military are efficiently fulfilling their work in perfectly coordinated unity in their administration in the roman art of crucifixion. So precise was this macabre form of torture and death, that in the way they hung the bodies to the cross they could determine how long it would take the victim to die. We see our Centurion holding down the foot of Jesus as he glances at Jesus’ Mother and the other Mary by her side. He will NOT do any of the nailing! 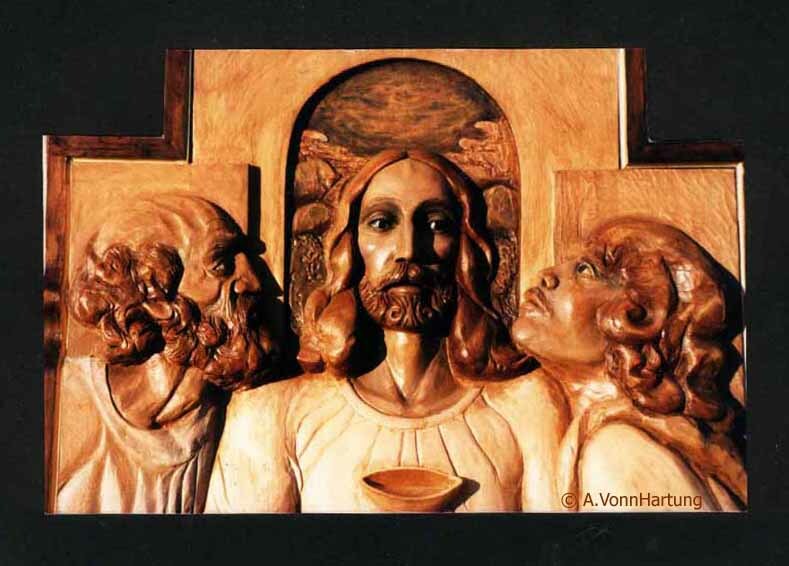 To the left of Jesus and also in the foreground looms the ghostly spirit of Judas Iscariot- a portrait of the condemned. So we see the two extremes of Good and Evil that frame the composition from one side to the other, with the figure of Jesus centered; the crossbars of His cross so much like the balanced scales of judgment. The moment Jesus dies the veil of the temple is split and lightning splits the sky. The Good Thief is as if sheltered from this terrible light of truth that this was the son of God condemned falsely, and that he the condemned criminal who dared to believe in Him will be in paradise today. Jesus was lanced through the heart from which blood and water flowed so as to fulfill the prophecy “Not one of His bones will be broken” (John 19:36), as the Passover was at hand, as Jesus had only hung on the cross for around six hours in his excruciating agony which must have seemed like a lifetime. 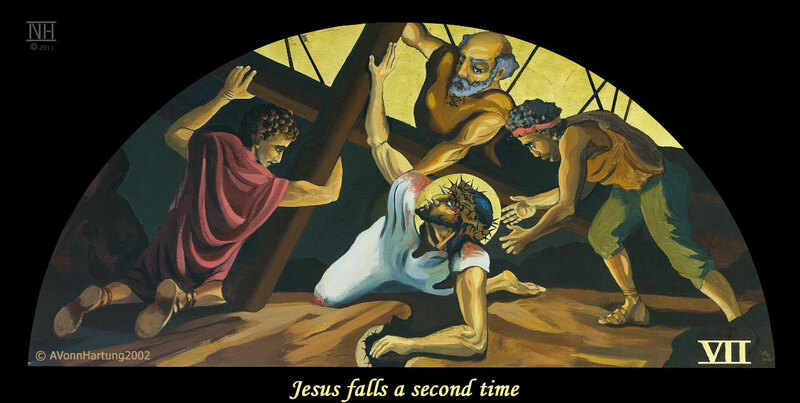 In Jesus’ case he would have had to push up on the nails that severed his feet in order to breathe, as the weight of his body would pull his lungs apart and he would suffocate if he did not excruciatingly push himself up to breathe one painful breath at a time. We might contemplate this in prayer by imagining the pain as we breathe in and out in contemplation. 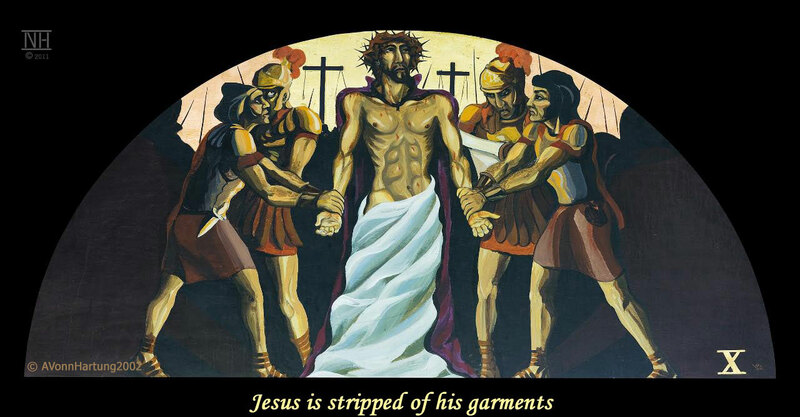 It is said that Jesus sweated blood in the end that through lack of oxygen and muscle spasm, his capillary system was ruptured. 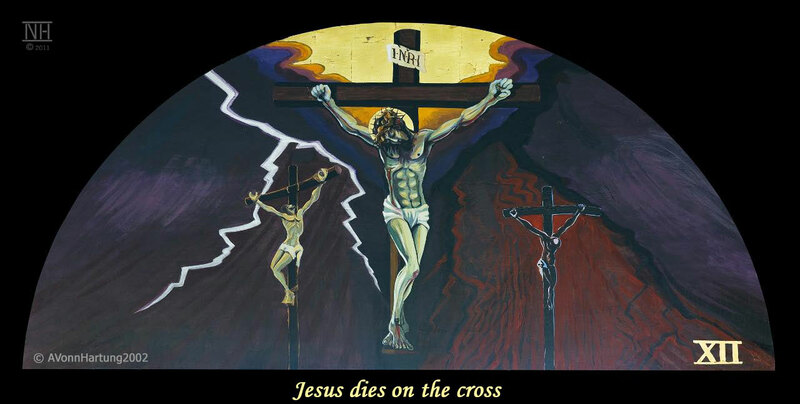 Crucifixion truly is the most excruciatingly painful death that can be imagined! This station imagines Nicodemus, John, Mother Mary and her saintly companions taking down the precious body of our Lord from the cross. The cross becomes a holy relic, therefore seen as a vertical golden light. This light of grace spreads horizontally into His saints and will at Pentecost spread throughout the world to His believers as the breath of God in The Holy Spirit. Again, imagined as holy light in the darkened tomb, we see Jesus’ mother, friends and fellow believers anointing and wrapping His sacred body as His spirit hovers above before it descends into “sheol”. The scene is quiet and serene, as is death after such horrific trials of violence. It is the light of Faith and Hope in The Resurrection that obliterates darkness and death and is SEEN here in the peacock, Symbol of Paradise. Thanks a million for allowing all of us to contemplate Christ passion through the meditation of your wonderful paintings and commentaries. God bless you and all your family, now and always! Thank you so much, Vonn (and Patty,) for sharing not only the beautiful paintings, but the explanations of the significance of what you chose to paint. You bring sacred art ALIVE! Words aren’t adequate to express my gratitude, but lacking anything better, thank you, from the top and bottom of my heart! Dearest Vonn (and Patty)… as always, your paintings are superb and filled with love and emotion pushing the hate and negativity away. Bravo! You are an amazing talent and a blessing to all who are lucky enough to view these pieces in person. Just prayed along with your wonderful art, readings and explanations of your detailed work of art. 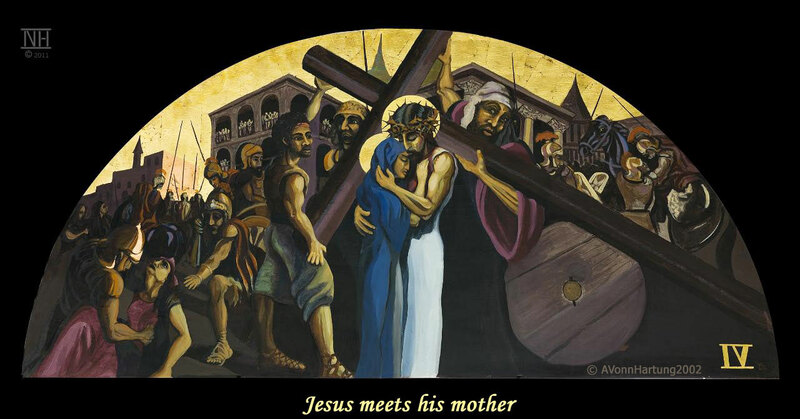 Truly inspiring now in Holy Week, bringing home again to me the excruciating pain Jesus must have suffered for our sake. I look forward to the blessings at Easter Sunday. This is very thought provoking! Thank you for the exlpanations of images in the paintings that are visible but not necessarily seen. This also provides encouragement to go back and view rhe paintings in Guaynabo. Thank you. I wish you & Patty a happy and blessed Easter. Gracias por compartir tu talento tanto artístico como espiritual! Con Tu testimonio e interpretación , nos edificas y ayudas a crecer en este camino de santidad para llegar a la Gloria con Dios!